For other uses, see Spinning wheel (disambiguation). A spinning wheel is a device for spinning thread or yarn from natural or synthetic fibres. Spinning wheels were first used in India, between 500 and 1000 A.D. Spinning machinery, such as the spinning jenny and spinning frame, displaced the spinning wheel during the Industrial Revolution. The spinning wheel was invented in India, between 500 and 1000 A.D. 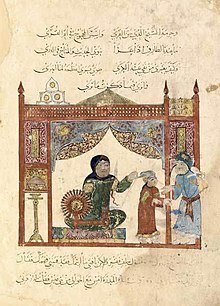 The earliest clear illustrations of the spinning wheel come from Baghdad (drawn in 1234), China (c. 1270) and Europe (c. 1280), and there is evidence that spinning wheels had already come into use in both China [a] and the Islamic world during the eleventh century. In France the spindle and distaff were not displaced until the mid 18th century. The spinning wheel replaced the earlier method of hand spinning with a spindle. The first stage in mechanizing the process was mounting the spindle horizontally so it could be rotated by a cord encircling a large, hand-driven wheel. The great wheel is an example of this type, where the fibre is held in the left hand and the wheel slowly turned with the right. Holding the fibre at a slight angle to the spindle produced the necessary twist. The spun yarn was then wound onto the spindle by moving it so as to form a right angle with the spindle. This type of wheel, while known in Europe by the 14th century, was not in general use until later. The construction of the Great Wheel made it very good at creating long drawn soft fuzzy wools, but very difficult to create the strong smooth yarns needed to create warp for weaving. Spinning wheels ultimately did not develop the capability to spin a variety of yarns until the beginning of the 19th century and the mechanization of spinning. In general, the spinning technology was known for a long time before being adopted by the majority of people, thus making it hard to fix dates of the improvements. In 1533, a citizen of Brunswick is said to have added a treadle, by which the spinner could rotate her spindle with one foot and have both hands free to spin. Leonardo da Vinci drew a picture of the flyer, which twists the yarn before winding it onto the spindle. During the 16th century a treadle wheel with flyer was in common use, and gained such names as the Saxony wheel and the flax wheel. It sped up production, as one needn't stop spinning to wind up the yarn. On the eve of the Industrial revolution it took at least five spinners to supply one weaver. 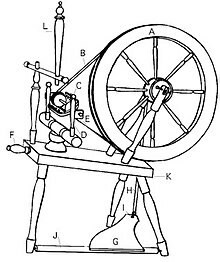 Lewis Paul and John Wyatt first worked on the problem in 1738, patenting the Roller Spinning machine and the flyer-and-bobbin system, for drawing wool to a more even thickness. Using two sets of rollers that travelled at different speeds, yarn could be twisted and spun quickly and efficiently. However, they did not have much financial success. In 1771, Richard Arkwright used waterwheels to power looms for the production of cotton cloth, his invention becoming known as the water frame. More modern spinning machines use a mechanical means to rotate the spindle, as well as an automatic method to draw out fibres, and devices to work many spindles together at speeds previously unattainable. Newer technologies that offer even faster yarn production include friction spinning, an open-end system, and air jets. Numerous types of spinning wheels exist, including the great wheel also known as walking wheel or wool wheel for rapid long draw spinning of woolen-spun yarns; the flax wheel, which is a double-drive wheel used with a distaff for spinning linen; saxony and upright wheels, all-purpose treadle driven wheels used to spin both woolen and worsted-spun yarns; and the charkha, native to Asia. Until the acceptance of rotor spinning wheel, all yarns were produced by aligning fibres through drawing techniques and then twisting the fiber together. With rotor spinning, the fibers in the roving are separated, thus opened, and then wrapped and twisted as the yarn is drawn out of the rotor cup. The tabletop or floor charkha is one of the oldest known forms of the spinning wheel. The charkha works similarly to the great wheel, with a drive wheel being turned by hand, while the yarn is spun off the tip of the spindle. The floor charkha and the great wheel closely resemble each other. With both, the spinning must stop in order to wind the yarn onto the spindle. The word charkha, which has links with Persian چرخ: charKh, wheel, is related to the Sanskrit word for "circle" (cakra). The charkha was both a tool and a symbol of the Indian independence movement. The charkha, a small, portable, hand-cranked wheel, is ideal for spinning cotton and other fine, short-staple fibres, though it can be used to spin other fibers as well. The size varies, from that of a hardbound novel to the size of a briefcase, to a floor charkha. Mahatma Gandhi brought the charkha into wider use with his teachings. He hoped the charkha would assist the people of India achieve self-sufficiency and independence, and therefore used the charkha as a symbol of the Indian independence movement and included it on earlier versions of the Flag of India. The great wheel is usually over 5 feet (1.5 m) in height. The large drive wheel turns the much smaller spindle assembly, with the spindle revolving many times for each turn of the drive wheel. The yarn is spun at an angle off the tip of the spindle, and is then stored on the spindle. To begin spinning on a great wheel, first a leader (a length of waste yarn) is tied onto the base of the spindle and spiraled up to the tip. Then the spinner overlaps a handful of fiber with the leader, holding both gently together with the left hand, and begins to slowly turn the drive wheel clockwise with the right hand, while simultaneously walking backward and drawing the fibre in the left hand away from the spindle at an angle. The left hand must control the tension on the wool to produce an even result. Once a sufficient amount of yarn has been made, the spinner turns the wheel backward a short distance to unwind the spiral on the spindle, then turns it clockwise again, and winds the newly made yarn onto the spindle, finishing the wind-on by spiralling back out to the tip again to make another draw. This type of wheel is powered by the spinner's foot rather than their hand or a motor. The spinner sits and pumps a foot treadle that turns the drive wheel via a crankshaft and a connecting rod. This leaves both hands free for drafting the fibers, which is necessary in the short draw spinning technique, which is often used on this type of wheel. The old-fashioned pointed driven spindle is not a common feature of the treadle wheel. Instead, most modern wheels employ a flyer-and-bobbin system which twists the yarn and winds it onto a spool simultaneously. These wheels can be single- or double-treadle; which is a matter of preference and does not affect the operation of the wheel. The double drive wheel is named after its drive band, which goes around the spinning wheel twice. The drive band turns the flyer, which is the horse-shoe shaped piece of wood surrounding the bobbin, as well as the bobbin. Due to a difference in the size of the whorls (the round pieces or pulleys around which the drive band runs) the bobbin whorl, which has a smaller radius than the flyer whorl, turns slightly faster. Thus both the flyer and bobbin rotate to twist the yarn, and the difference in speed continually winds the yarn onto the bobbin. Generally the speed difference or "ratio" is adjusted by the size of the whorls and the tension of the drive band. A single drive wheel has one drive band that the flywheel and the flyer, and a short tension band which goes only over the bobbin. The tension band adds an adjustable amount of drag to the bobbin and thereby increases the yarn take up force. While the spinner is making new yarn, the bobbin and the flyer turn in unison, driven by the single drive band. When the spinner feeds the yarn onto the bobbin, the drag on the flyer slows it and thus the yarn winds on. The tighter the tension band is, the more pull on the yarn, because the more friction the bobbin has to overcome to turn in sync with the flyer. When the spindle or flyer is located above the wheel, rather than off to one side, the wheel is said to be an upright wheel. This type of wheel is often more compact, thus easier to store. Some upright wheels are even made to fold up small enough that they fit in carry-on luggage at the airport. An Irish castle wheel is a type of upright in which the flyer is located below the drive wheel. The spinning wheel increased the productivity of thread making by a factor of greater than 10. Medieval historian Lynn White credited the spinning wheel with increasing the supply of rags, which led to cheap paper, which was a factor in the development of printing. Food, clothing and shelter are the three basic necessities for the survival of human beings. In poverty struck areas in the world, the charkha can prove to be helpful in providing clothing to the needy and downtrodden. Often, attendance of poor kids is negligible in schools mainly due to lack of proper uniforms. This sector face severe problems of food, clothing and shelter and are hence, forced to ignore education. The ubiquity of the spinning wheel has led to its inclusion in the art, literature and other expressions of numerous cultures around the world, and in the case of South Asia it has become a powerful political symbol. Starting in 1931, the traditional spinning wheel became the primary symbol on the flag of the Provisional Government of Free India. Mahatma Gandhi’s manner of dress and commitment to hand spinning were essential elements of his philosophy and politics. He chose the traditional loincloth as a rejection of Western culture and a symbolic identification with the poor of India. His personal choice became a powerful political gesture as he urged his more privileged followers to copy his example and discard—or even burn—their European-style clothing and return with pride to their ancient, pre-colonial culture.[when?] 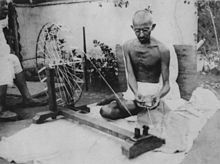 Gandhi claimed that spinning thread in the traditional manner also had material advantages, as it would create the basis for economic independence and the possibility of survival for India’s impoverished rural areas. This commitment to traditional cloth making was also part of a larger swadeshi movement, which aimed for the boycott of all British goods. As Gandhi explained to Charlie Chaplin in 1931, the return to spinning did not mean a rejection of all modern technology but of the exploitative and controlling economic and political system in which textile manufacture had become entangled. Gandhi said, “Machinery in the past has made us dependent on England, and the only way we can rid ourselves of the dependence is to boycott all goods made by machinery. This is why we have made it the patriotic duty of every Indian to spin his own cotton and weave his own cloth." St Elizabeth of Hungary Spinning for the Poor, by Marianne Stokes. The depiction of St Elizabeth shows a castle-style spinning wheel and a distaff used to hold the fiber. The Golden Spinning Wheel (Zlatý kolovrat) is a Czech poem by Karel Jaromír Erben that was included in his classic collection of folk ballads, Kytice. Rumpelstiltskin, one of the tales collected by the Brothers Grimm, revolves around a woman who is imprisoned under threat of execution unless she can spin straw into gold. Rumpelstiltskin helps her with this task, ultimately at the cost of her first-born child; however, she makes a new bargain with him and is able to keep her child after successfully guessing his name. Another folk tale that incorporates spinning wheels is the classic fairy tale Sleeping Beauty, in which the main character pricks her hand or finger on the poisoned spindle of a spinning wheel and falls into a deep sleep following a wicked fairy or witch's curse. Numerous variations of the tale exist (the Brothers Grimm had one in their collection entitled Little Briar Rose), and in only some of them is the spindle actually attached to/associated with a spinning wheel. Perhaps surprisingly, a traditional spindle does not have a sharp end that could prick a person's finger (unlike the walking wheel, often used for wool spinning). Despite this, the narrative idea persists that Sleeping Beauty or Briar Rose or Dornrosen pricks her finger on the spindle—a device which she has never seen before, as they have been banned from the kingdom in a forlorn attempt to prevent the curse of the wicked godmother-fairy. Louisa May Alcott, most famous as the author of Little Women, wrote a collection of short stories called Spinning-Wheel Stories, which were not about spinning wheels but instead meant to be read while engaging in the rather tedious act of using a spinning wheel. In 1814, Franz Schubert composed "Gretchen am Spinnrade", a lied for piano and voice based on a poem from Goethe's Faust. the piano part depicts Gretchen's restlessness as she spins on a spinning wheel while waiting by a window for her love to return. Antonín Dvořák composed The Golden Spinning Wheel, a symphonic poem based on the folk ballad from Kytice by Karel Jaromír Erben. Camille Saint-Saëns wrote Le Rouet d'Omphale (Omphale's Spinning Wheel), symphonic poem in A major, Op. 31, a musical treatment of the classical story of Omphale and Heracles. A favorite piano work for students is Albert Ellmenreich's Spinnleidchen (Spinning Song), from his 1863 Musikalische Genrebilder, Op. 14. An ostinato of repeating melodic fifths represents the spinning wheel. The Spinning Wheel is also the title/subject of a classic Irish folk song by John Francis Waller. 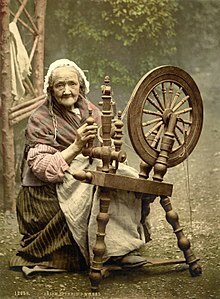 A traditional Irish folk song, Túirne Mháire, is generally sung in praise of the spinning wheel, but was regarded by Mrs Costelloe, who collected it, as "much corrupted", and may have had a darker narrative. It is widely taught in junior schools in Ireland. Sun Charkhe Di Mithi Mithi Kook is a Sufi song in the Punjabi language inspired by the traditional spinning wheel. It is an ode by a lover as she remembers her beloved with the sound of every spin of her Charkha. Spinning wheels also feature prominently in the Wagner opera The Flying Dutchman; the second act begins with local girls sitting at their wheels and singing about the act of spinning. Gilbert and Sullivan's Yeoman of the Guard begins with a solitary character singing while spinning at her wheel, the first of their operettas not to open with a chorus. Spinning wheels may be found as motifs in art around the world, ranging from their status as domestic/utilitarian items to their more symbolic role (such as in India, where they may have political implications). 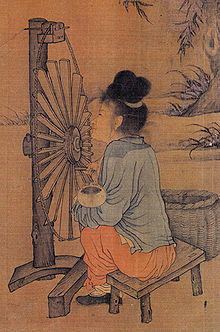 ^ According to Mark Elvin, 14th-century Chinese technical manuals describe an automatic water-powered spinning wheel. Comparable devices were not developed in Europe until the 18th century. However, it fell into disuse when fiber production shifted from hemp to cotton. It was forgotten by the 17th century. The decline of the automatic spinning wheel in China is an important part of Elvin's high level equilibrium trap theory to explain why there was no indigenous industrial Revolution in China despite its high levels of wealth and scientific knowledge. 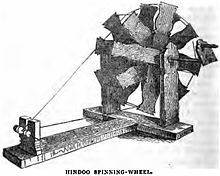 ^ "Hindoo Spinning-Wheel" (PDF). The Wesleyan Juvenile Offering: A Miscellany of Missionary Information for Young Persons. Wesleyan Missionary Society. IX: 108. September 1852. Retrieved 24 February 2016. ^ a b Smith, C. Wayne; Cothren, J. Tom (1999). Cotton: Origin, History, Technology, and Production. 4. John Wiley & Sons. pp. viii. ISBN 978-0471180456. The first improvement in spinning technology was the spinning wheel, which was invented in India between 500 and 1000 A.D.
^ Landes, David. S. (1969). The Unbound Prometheus: Technological Change and Industrial Development in Western Europe from 1750 to the Present. Cambridge, New York: Press Syndicate of the University of Cambridge. p. 138. ISBN 0-521-09418-6. ^ a b "Spinning wheel". The New Encyclopædia Britannica. 11 (15 ed.). Chicago: Encyclopædia Britannica, Inc. 1998. p. 99. Retrieved 7 November 2018. ^ Johnson, Ruth A. (2011). All Things Medieval: An Encyclopedia of the Medieval World. Santa Barbara, California: Greenwood. ISBN 978-0-313-36462-4. ^ Marchetti, Cesare (1978). "A Postmortem Technology Assessment of the Spinning Wheel: The Last 1000 Years, Technological Forecasting and Social Change, 13; pp. 91-93" (PDF). ^ "Charkha Project – Shree Aniruddha Upasana Foundation". Aniruddhafoundation.com. Retrieved 2019-03-04. ^ "Spinning beyond freedom". Mumbaimirror.indiatimes.com. 2010-08-13. Retrieved 2019-03-04. ^ "Mainlesson.com". Mainlesson.com. Retrieved 2012-04-05. ^ Perrault, Charles (1 January 1880). "Les contes de Perrault: d'après les textes originaux ; avec notices, notes et variantes, et une étude sur leurs origines et leur sens mythique". A. Lemerre – via Google Books. ^ "Sacred-texts.com". Sacred-texts.com. Retrieved 2012-04-05. ^ "Surlaunefairytales.com". Surlalunefairytales.com. Retrieved 2012-04-05. ^ "Surlaunefairytales.com". Surlalunefairytales.com. 2006-10-15. Retrieved 2012-04-05. ^ "Archive.org". Archive.org. 2001-03-10. Retrieved 2012-04-05. ^ "Gretchen am Spinnrade ("Meine Ruh'..."), song for voice & piano, D. 118 (Op. 2) – Franz Schubert". AllMusic. Retrieved 8 August 2014. ^ Reel, James. "Le Rouet d'Omphale, symphonic poem in A major, Op. 31 – Camille Saint-Saëns". AllMusic. Retrieved 2012-04-05. ^ "Musikalische Genrebilder, Op.14 (Ellmenreich, Albert". Retrieved 1 February 2016. ^ "Worldmusic.about.com". Worldmusic.about.com. 2011-04-04. Retrieved 2012-04-05. ^ "Ireland-information.com". Ireland-information.com. Retrieved 2012-04-05. ^ "Joe Heaney.org". Ollscoil na hÉireann, Gaillimh. 2010–2011. Retrieved 2014-08-23. Look up spinning wheel in Wiktionary, the free dictionary. Wikimedia Commons has media related to Spinning wheels.